All Turf is on Display! 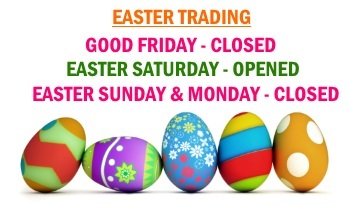 THERE WILL BE NO TURF DELIVERIES OVER EASTER WEEKEND! – ALWAYS lay your new turf the SAME DAY that it gets DELIVERED! With Sth East Qld’s often hot and humid conditions, turf can heat up and burn when left stacked on the pallet for extended periods of time ie: overnight. Warner Garden Centre will not replace damaged turf that has been left on the pallet overnight. – NEVER water your turf while it is STACKED ON PALLET! – If you suspect that somethings is wrong with your turf when laying it, then please call us IMMEDIATELY (at worst take some pictures of the affected turf). It’s hard to deal with issues 2 weeks after the job is done. TIP: Don’t use soaker hoses to water your new turf as they can be very ineffective. A simple metal dome sprinkler is a better alternative! During winter some of our turf farms will harvest your turf on the day (starting at 7am) prior to your delivery so as to ensure their trucks are making an early start for deliveries. With this in mind, please allow 36hrs notice if you wish to cancel or postpone an order. 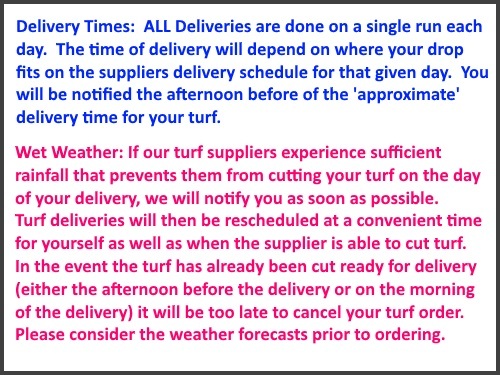 Where turf is already cut and cannot be reallocated to other orders, your order cannot be cancelled or postponed. For orders of 100m2 or more only. For orders of 100m2 or more only. Free Delivery is subject to availability. Palmetto Buffalo (Stenotaphrum secundatum ‘SS100’) Grass is one our most popular selling soft leaf buffalo grass. It is a tough, soft leaf Buffalo which provides a lawn that has excellent winter colour whilst generally out competing most weeds once established. Palmetto Buffalo grass performs well in full sun, yet thrives in shaded areas where other grasses fail. $9.95 per square metre plus $85 delivery. ORDERS THAT ARE LESS THAN 30m2, DELIVERY WILL COST $121. For orders of 100m2 or more we currently have a special price of $9.65/m2 with FREE Delivery. Turf is cut and delivered direct from the turf farm. Delivery lead times generally depends on demand and availability of pallet spaces on the trucks. All deliveries are done on a single run in the day so your delivery time will depend on where your drop fits on the run. We will notify via SMS the afternoon before your delivery day with the expected 2 hour delivery window (eg: 8-10am, 9-11am, etc). Small quantities can be picked up from our yard on a Friday but it needs to be pre-ordered and paid for in full by the Wednesday of that week. We do not keep extra turf in stock at our shop. Sapphire Buffalo (Stenotaphrum secundatum ‘B12’ ) Grass has all the benefits of the other high performance soft leaf Buffalo grass varieties (less watering, deep roots, greener in winter, hard wearing etc.) along with the added benefit of a finer texture. Sapphire Buffalo grass does not rely on fine leaves for its fine texture, but its folding leaf. When Sapphire is mature, its leaf folds at tight angles along its axis, resulting in a finer texture. Sir Walter Turf, also known as Sir Walter Buffalo Grass, is the most successful lawn grass in Australia. It has a broad leaf, deep green in colour which is soft to the touch and simply beautiful all year round. It has incredible shade tolerance only requiring 2 to 3 hours full sun per day. Sir Walter Buffalo Grass is also drought tolerant which is great for our South East Queensland climate. Our Sir Walter supplier is a long time accredited Turf Queensland Accredited grower who has been growing 100% pure Sir Walter grass for many years. $10.95 per square metre plus $66 delivery. All deliveries are done on a single run in the day so your delivery time will depend on where your drop fits on the run. Our turf farm will call you on the afternoon before your delivery to advise you of the expected delivery time. If you don’t like the broad leaf texture of the buffalo lawns and don’t want the maintenance of a couch lawn, then Empire™ Zoysia is for you. Empire™ Zoysia is quickly becoming one of our more popular lawn choices, and for good reason. Empire™ Zoysia grows Australia Wide and provides a lawn which is easy to look after. It has a relatively fine leaf which is soft to touch, excellent wear tolerance and thrives in extreme heat and humidity. Empire™ Zoysia is good in the shade but still requires a minimum of 5 hours direct sun. For orders of 100m2 or more we currently have a special price of $9.95/m2 with FREE Delivery. .
Wintergreen is a hybrid green couch that has high colour retention throughout the year and a fine, dense foliage. It is perfect for families who want a durable yet soft lawn at an economic price. Wintergreen is used extensively in home lawns, council parks and housing estates making it the most common choice in Queensland. $4.75 per square metre plus $85 delivery. ORDERS THAT ARE LESS THAN 30m2, DELIVERY WILL COST $121. For orders of 100m2 or more we currently have a special of FREE Delivery. Free DELIVERY is subject to availability with supplier. $6.95 per square metre plus $88 delivery. All deliveries are done on a single run in the day so your delivery time will depend on where your drop fits on the run. We will notify via SMS the afternoon before your delivery day with the expected delivery time. Tropica couch is a very similar to Queensland Blue Couch, with a green color and a soft, lush feel and a slightly broader leaf. It is a fast grower and requires full sun or dappled shade conditions only. $8.95 per square metre plus $88 delivery.